Fact . . . I grew up in Hershey, Pennsylvania. Yup, home of the Hershey chocolate factory. My dad made chocolate. So Hershey kisses mean something extra special to my family. One of the best things about the Hershey kiss is that you can eat just one or two for a simple treat. No big commitment, just a sweet treat. Each holiday/season, Hershey introduces themed kisses . . . either by color, flavor or both. I chose the Hershey milk chocolate kisses, along with the Hugs kisses (a swirled white and chocolate version). You only need a few materials for this project. 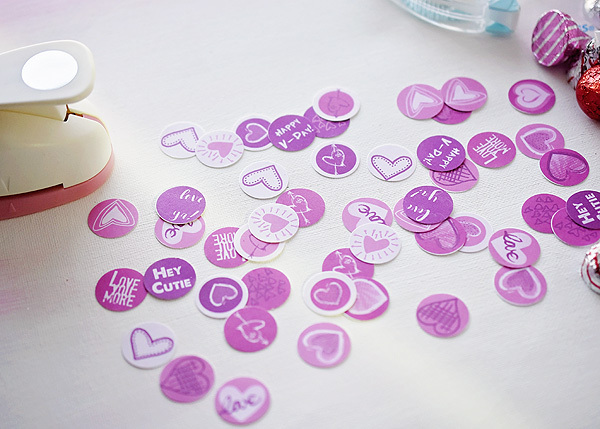 Download the labels below, a pair of scissors or paper cutters, a 3/4" hole punch and glue or double stick tape. Oh and lots of Hershey kisses! I print the labels on white card stock. Then I cut into stripes, so they are easy to punch out. 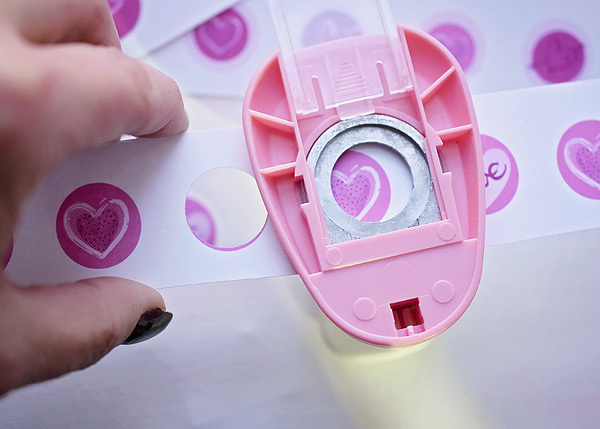 Cool trick with the hole punch, turn it over so that you can line up the circle in the punch for a perfect cut. 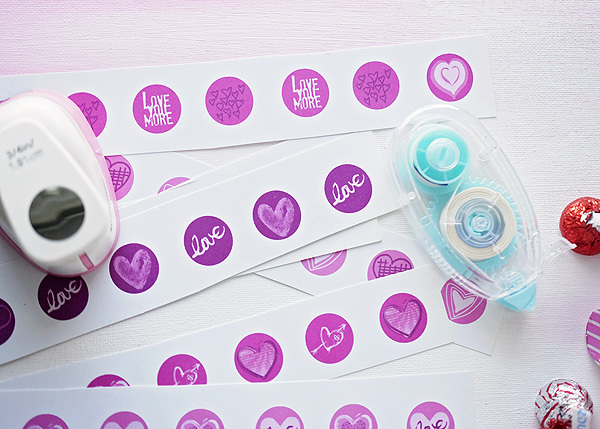 Once you have all the labels punched, I like to use a double stick tape roller. It's quick, clean and ensures a strong bond. They are fun to package up in cello bags with ribbon or in mugs. A perfect treat for colleagues, neighbors or teachers. CLICK TO DOWNLOAD THE FREE LABEL SHEET! Dec 8 Quick Christmas Card FREE Printable - It's Not Too Late!